There are several hairstyles that dated back to dynasties before Joseon Dynasty and continued to be widely used among the Joseon people. As women were more particular about their beauty, there were more variety of women’s hairstyles compared to the men. Some of the hairstyles here had other names but I just took the common names to be used in this post. Eoyeo meori (어여머리): The hairstyle for the female members of the royal family who were staying inside the palace after the marriage such as the queens consort and queens dowager. It involved several important parts: the wig to make the halo around the head of the wearer, som jokduri as a headrest, maegae daenggi to hold the wig in place, and tteoljam to adorn the wig. Cheopji meori (첩지머리): Another hairstyle for the women of the palace, except that it was worn by the royal women as well as the high ranking court ladies and the government officers’ wives. The name was derived from the main ornament for this style, cheopji. The wearer of this style would tie the hair into a bun behind. 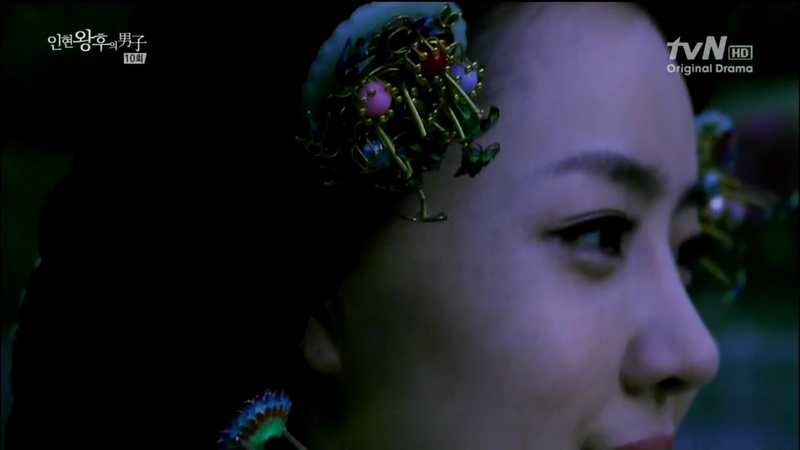 Ornamental hairpins such as yongjam, bongjam, and cheopji were worn according to the wearer’s rank. Tteoguji meori (떠구지머리): This hairstyle was reserved for special ceremonies and worn by the queens, royal concubines, royal consorts, and high ranking court ladies. It consisted of the wig shaped around the head just like the eoyeo meori style and – as the name suggested – tteoguji. Tteoljam was also worn with this hairstyle but only the royal women could wear the ornament on the wig. It is also known as keun meori (큰머리). Daesu meori (대수머리): With the heavy daesu as the main headgear for the hairstyle, it was reserved for the royal consorts, especially the queens and crown princesses for special ceremonies such as wedding. The hairstyle was worn with the lavish jeokui. 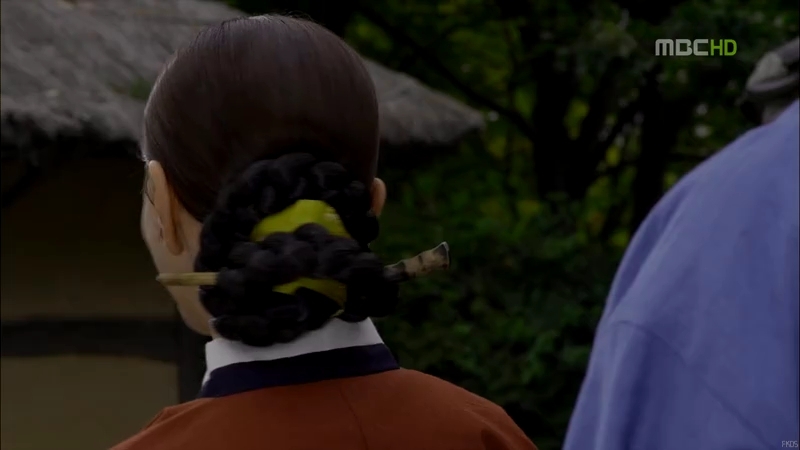 Saeng meori (생머리): A hairstyle for the younger court ladies such as saenggaksi (young court ladies around 9-14 years old) and nain (slightly older court ladies before they were raised to the rank of sanggung). The hair was parted into several parts and it was braided and folded. The number of parts depended on the departments in which the court ladies worked: jimil nain had four parts while chimbang and sukbang nain had their hair divided into two parts. The daenggi for this hairstyle depended on the number of parts too: negadak daenggi for the four-part (네 – ne = four, 가닥 – gadak = the part of hair) and dugadak daenggi for two-part ( 두 – du = two) saeng meori. Badukpan meori (바둑판머리): A hairstyle for girls around 3-4 years old. A part of hair on each side of the hair were made into small braids and then combined with the main braid on the back of the head. Baetssi daenggi was worn on the parted hair and daenggi was tied near the end of the main braid. Sangtu (상투): This was the ordinary hairstyle for the men of the Joseon Dynasty, especially among the noblemen and the scholars. The hair was pulled into a topknot and a headband, manggeon, was used to hold the hair in place. Manggeon was also used to hold the headgears in place. The topknot was a sign of manhood for the men since they would start to wear their hair into a topknot when they got married, as they used to marry at a young age. Minsangtu (민상투): It’s the topknot for the lower class men and its difference compared to sangtu was the absence of manggeon. Ko meori (코머리): Reserved for the married lower class women, it used the original hair of the women braided into two pigtails and pulled onto the top of the hair. 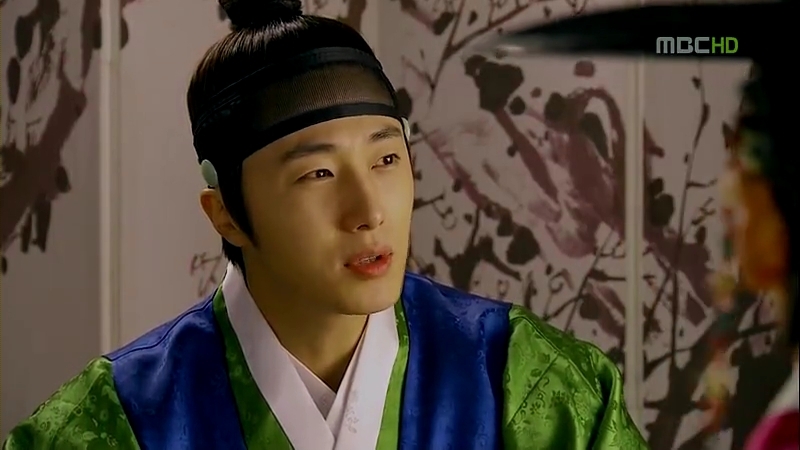 A daenggi, most of the time red, was fastened on the braided hair. Eonjun meori (얹은머리): Wig was the main component of this hairstyle and it was popular among the married women to show off their beauty with lavish wigs. 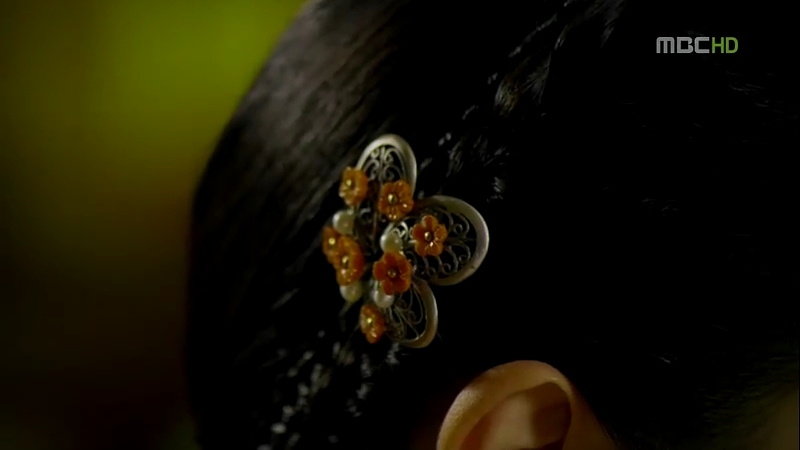 The gisaeng or courtesans also wore eonjun meori daily, adorned with hairpins and daenggi, together with jeonmo and noeul. The trend of showing off how big their wigs were proved to be deadly to the women since the wigs were heavy and after the usage of wigs had been prohibited during King Yeongjo’s reign, jokduri replaced the wigs. 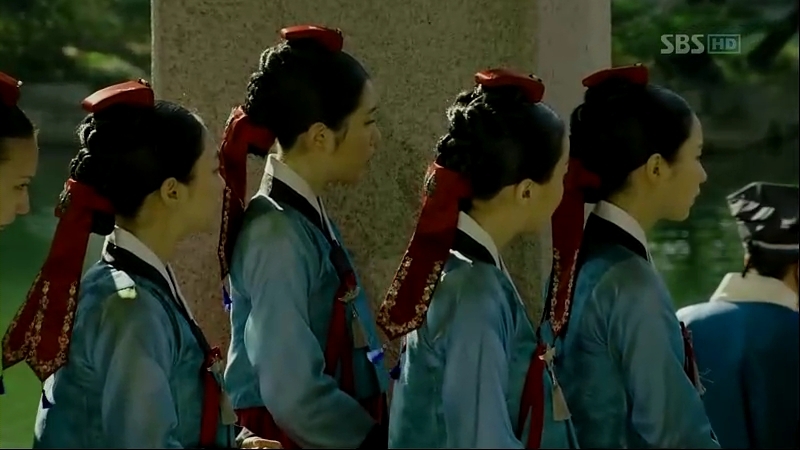 Ttoya meori (또야머리): A hairstyle for the women of the palace as well as the officers’ wives. The hair was pulled into a bun at the nape of the neck and the wig was used to make the bun bigger. Different hairpins were used to decorate the bun. Jojim meori (조짐머리): When the wearer wore a cheopji with the tteoya meori hairstyle, it’s called jojim meori. Jjok/Jjokjin meori (쪽/쪽진머리): After wigs were banned from public usage during Yeongjo’s reign, this hairstyle was used widely among the commoners who were married as well as the noble women and the royal women. Binyeo was the most common ornament to be used with this style. Ttaheun meori/ Kwimit meori (땋은머리/귀밑머리): Also known as daenggi meori (댕기머리), ttaeheun meori was the name for men’s hairstyle while kwimit meori was for women. This hairstyle was worn by young boys and girls before they get married. The hair was parted at the front and braided into long pigtails at the back. Daenggi was tied at the end of the braid. For the boys, they would wear hogeon while girl would wear their baetssi daenggi on their parted hair. As for the hair ornaments and headgears, women had a lot of them compared to men, as always. Ayam (아얌 ) was a winter cap for women made from silk and made to be open at the top. It consisted of a crown covering the forehead and a long tail-like ribbon. I was also called aegeom (액엄). Binyeo (비녀) was a hairpin inserted into a bun to hold the hair in position as well as denoting the status of the wearer. 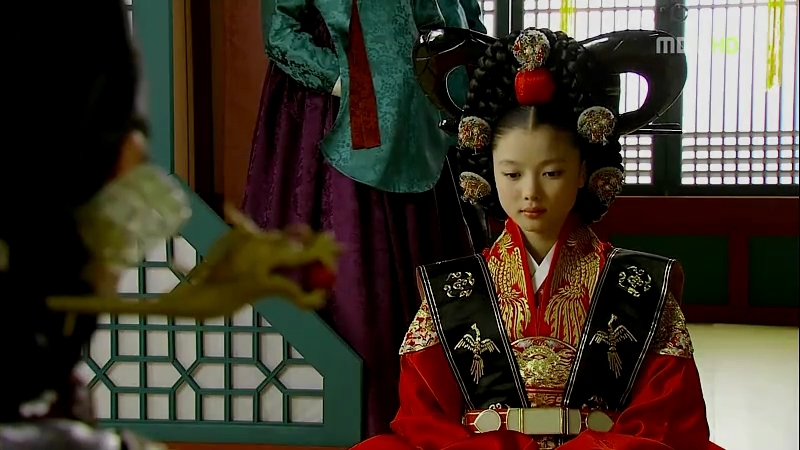 Cheopji (첩지) was the ornament worn on top of the parted hair for the married women of the palace and the court ladies. Cheopji depicted the wearer’s rank and used to part the hair. 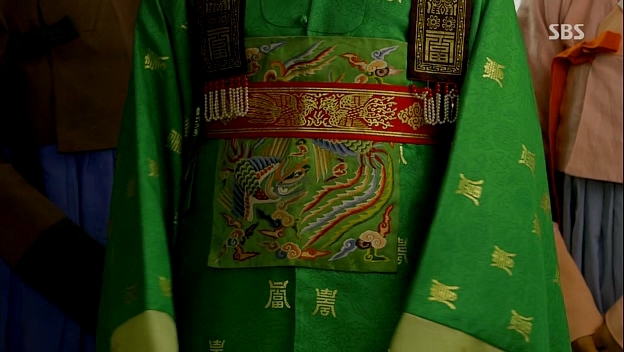 The wore dragon shaped cheopji; the queens consort and crown princesses wore nickel phoenix cheopji; sanggung wore silver frog cheopji; and the ministers’ wives wore nickel frog cheopji. 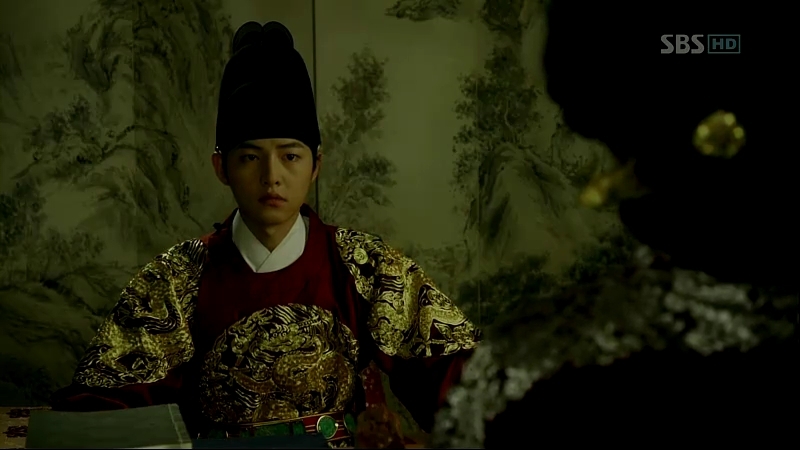 It was also used to hold the crowns such as jokduri and hwagwan in place since both were worn on top of the parted hair. Daenggi (댕기) was the generic term for all types of ribbons worn on the hair. The common colour for daenggi worn by Joseon people everyday was red, though in some circumstances, the colour varied from one user to another, and from one ceremony to another. There were several types of daenggi commonly used by the women and men, but most of them were for women. Baetssi daenggi (배씨 댕기): A small piece of ornament placed on top of the parted hair. The strings holding the baetssi would be tied behind the ears or combined with the main braid behind. It was worn by young girls before they get married. Doturak daenggi (도투락댕기): Also known as keun daenggi (큰댕기), which literally means ‘big daenggi‘, doturak daenggi was used as dwit daenggi (뒷댕기) or rear daenggi during wedding ceremony. Ap daenggi (앞댕기): A front daenggi worn by the bride with the long yongjam during wedding ceremony. Unlike deurim daenggi, it didn’t have the strings of pearls hanging from the ends and the patterns were embroidered with colourful strings. It’s simpler compared to the lavish deurim daenggi. Deurim daenggi (드림댕기): A type of the ap daenggi or front daenggi worn by the bride. The gold patterns were sewn onto the black/dark purple fabric of the daenggi and strings of pearls were attached at both ends. Mokpan daenggi (목판댕기): A daenggi worn by the maiden from the commoners. Its colour was usually red and had pointed ends. Jebiburi daenggi (제비부리댕기): It had the same pointed ends as mokpan daenggi but the difference that it had the gold patterns or geumbak. The princesses and high ranking noble women were those who could wear jebiburi daenggi. Tteoguji daenggi (떠구지댕기): It had straight instead of pointed ends and used together with tteoguji. Maegae daenggi (매개댕기): A long daenggi which looked like several ropes tied together. 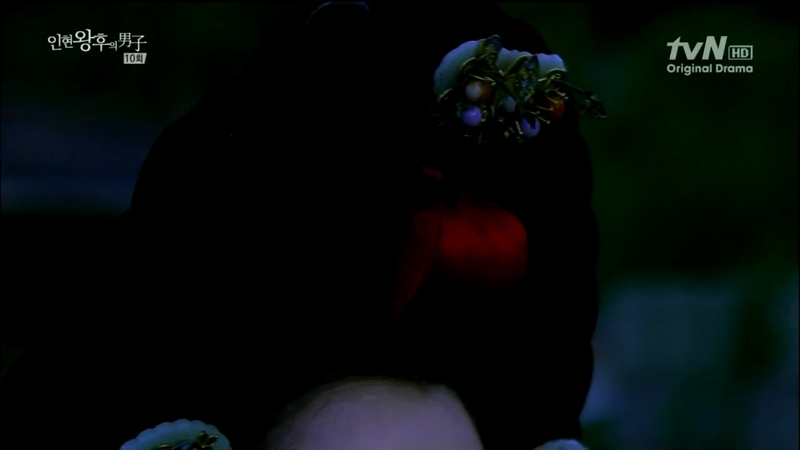 It was used to hold the eoyeo meori style in place, usually placed between the hair and the wig forming the halo. Malttuk daenggi (말뚝댕기): It looked like a mini version of doturak daenggi with straight ends but smaller and somehow simpler. However, it’s only worn by young girls. Jjok daenggi (쪽댕기): It was used to fasten the buns of the married women when they used jjokjin meori style. Negadak/dugadak/ patip daenggi (네가닥/두가닥/팥잎댕기): Reserved for the court ladies with the saeng meori style. 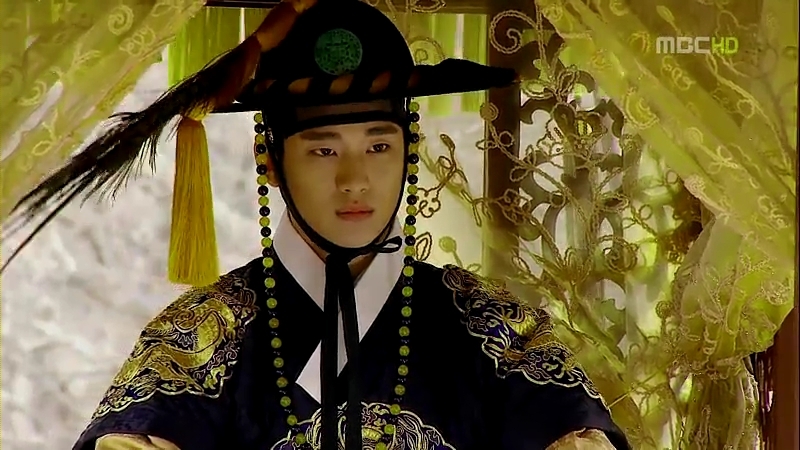 Daesu (대수) was a crown adorned with ornaments for the queens or princesses consort to be worn during special occasions. Dwikkoji (뒤꽂이) was a small ornamental hairpin used to adorn the buns or worn on the sides of the hair. Eoyeom jokduri (어염 족두리) was the cushion/ stuffed silk used as headrest for the hairstyle. Also known as som jokduri (솜족두리). 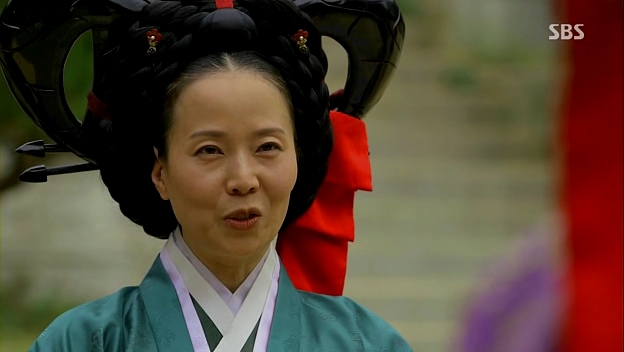 Gache (가체) was a generic term for the bulky wig used by the women of Joseon. The price was high and it was considered a prized possession among women. Garima (가리마) was a kind of headgear made from black silk. It looked like a board because of its stiffness and worn by the female physicians or uinyeo (의녀). Hwagwan (화관) was a more elaborate crown for bride compared to jokduri, with more adornments and of course, more expensive. Jam (잠) was a more lavish hairpin compared to binyeo, worn by the upper class women and royalties. The name depended on the design: yongjam ((용잠)) for those with dragon shape, bongjam (봉잠) for phoenix. A longer yongjam was used by the bride during her wedding to hold the ap daenggi or deurim daenggi. Jangot (장옷) was a cloth draped on the noble women’s heads to hide their faces to the men. It resembled a longer version of jeogori with the sleeves and the neckline. 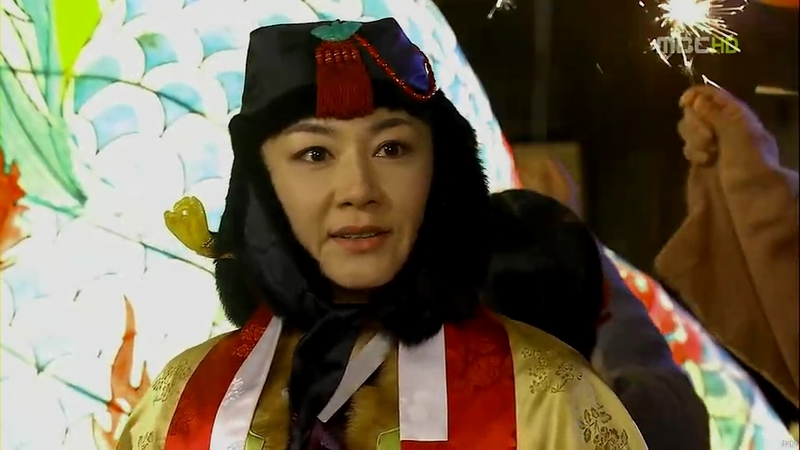 Jeonmo (전모), the hat worn by the gisaeng or the courtesans. The frame was made from bamboo and the cover was made from paper or cloth with decorations drawn on it. Jobawi (조바위) was a winter cap made from silk, with a crown covering the forehead and the ears. 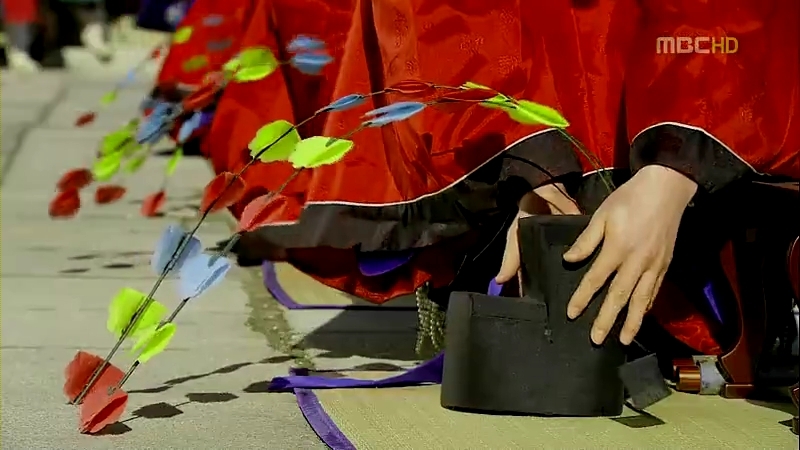 Jokduri (족두리) was a crown worn by the women during special occasions like wedding. It was also called jokgwan (족관). Nambawi (남바위) was a hat that served as a head warmer during winter, covering the ears and part of the neck. Noeul (노을) was a thin silk worn along with a hat (most of the time jeonmo) to hide the woman’s face. It’s usually made from black colored silk. Pungcha (풍차) was a winter hat similar to nambawi but with additional flaps to cover the neck. 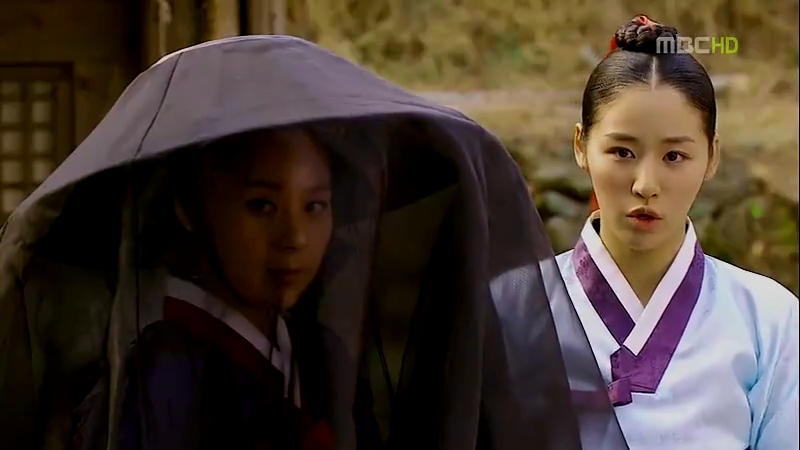 Sseugae Chima (쓰개치마) was another type of cloth used by the women of the commoner class to hide their faces. It resembled a chima with its waist band part. Tteoguji (떠구지) was a frame made of wood and then painted with lacquer. It was worn behind the wig and differentiated between eoyeo meori and keun meori styles. It was also known as geodumi (거두미). Tteoljam (떨잠) were the ornaments of various shapes with fluttering metals worn with the eoyeo meori hairstyle. They were also called tteolbinyeo (떨비녀). The men had fewer hair ornaments compared to women but they did have quite a number of headgears and crowns for daily usage as well as for special ceremonies. Aisahwa was a hat with branched flowers awarded by the kings for the top student in the royal government exam. It was also known as eosahwa (어사화). 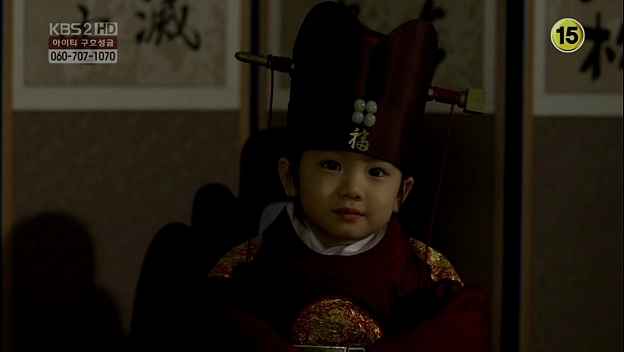 Baekrip (백립), any hat that is white in color, worn during the period of mourning. Banggat (방갓) was a hat made from straw that is worn by the monks when they are traveling. Also known as bangrip (방립). 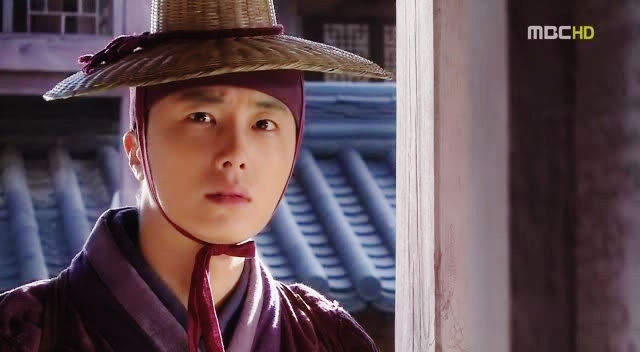 Bokgeon (복건) was a conical shaped headgear usually made from black or dark cloth, worn by scholars or young boys. Dongpagwan (동파관) was an indoor hat worn by the scholars or the noblemen. It was made from either black fabric or horse hair. It had two panels on the front and back of it. Gat (갓) was an archaic term for hat. Usually referred to the hats worn by the noblemen. 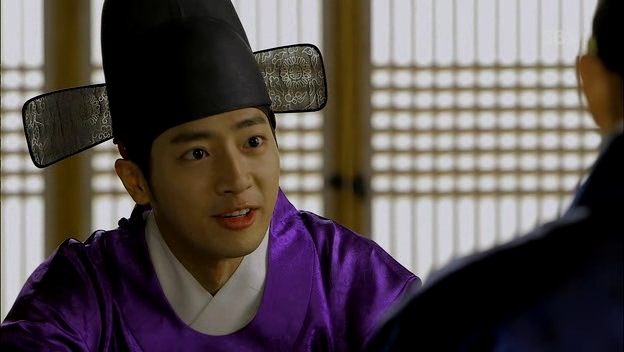 Gatkkeun (갓끈) was the bead strings worn by the noblemen together with their gat. 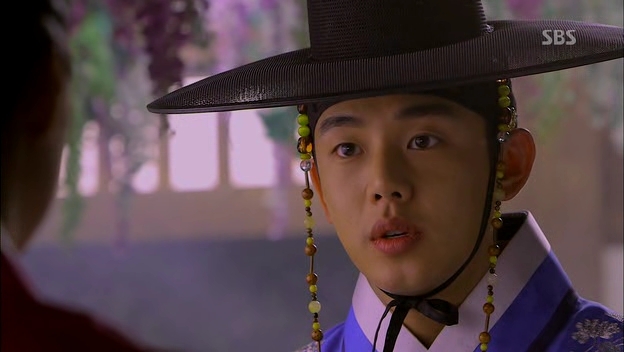 Gongjeongchaek (공정책) was a hat worn by a soon-to-be Crown Prince before his coronation or the firstborn prince, who would eventually become the Crown Prince. Gwanja (관자) was pair of buttons attached to the manggeon. Used to make the hats stay in place as well as depicting the rank of the wearer. Heukrip (흑립) was a general term for black hat with brim. The cylindrical crown made from woven horse hair and the brim made from various materials such as bamboo. 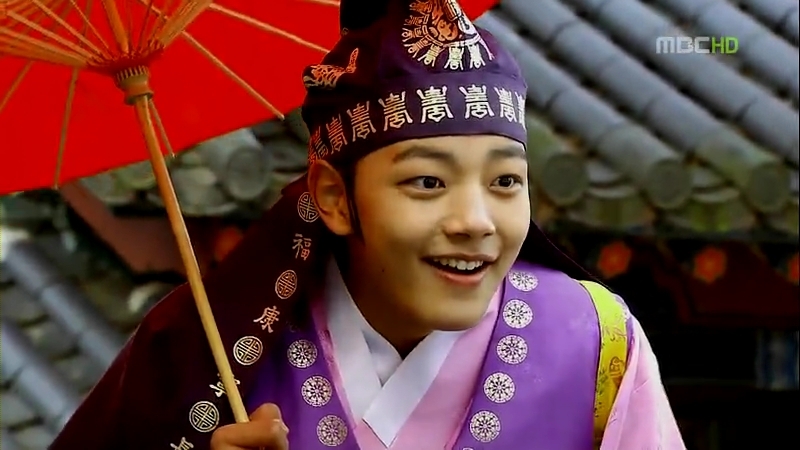 Hogeon (호건) was headgear similar to bokgeon except that it has tiger patterns sewn on the crown. It’s worn by young boys. 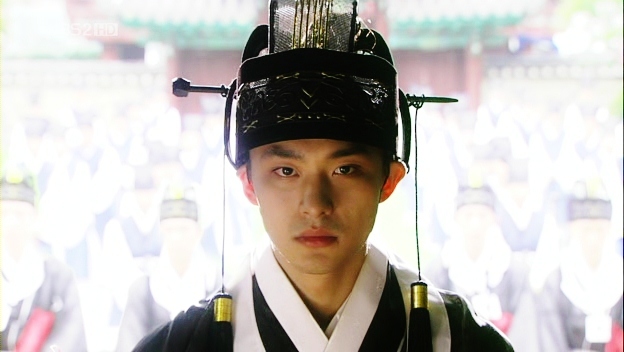 Ikseongwan (익선관) was the crown for the Joseon kings and crown princes. The wings at the back symbolized the high position of the wearer. Jegwan (제관) was a black ceremonial crown worn by lower officials together with jobok during major ceremonies. Jeongjagwan (정자관) was an indoor hat worn by the noblemen . Made from horse hair, it has several peaks. Jeonrip (전립) was a hat worn by the military personnel with a semi spherical crown . The decorations depended on the rank of the wearer. The size and name varied according to the region and it was also known as beonggeoji (벙거지), or byeongrip (병립). Jurip (주립) was any kind of hat that is red in color. Commonly seen to be worn by the guards . Manggeon (망건) was a headband worn by men on the forehead to keep their hair in place. Made from horse hair. Myeonryugwan (면류관) was the crown for the kings and the crown princes worn during special occasions such as rituals and weddings. Consisted of a flat board with dangling beaded strings in front and at the back. The number of strings determined the rank of the wearer. Okrorip was a hat worn by officials during their trips to foreign nations as delegates. It had a jade ornament shaped like a heron known as okrojeongja. Paerangi (패랭이) was a hat worn by the commoners and farmers, made from bamboo or straw. Samo (사모) was a headgear for the officials. Some have a pair of wing-like flaps at the back, depending on the rank of the wearer. Sangtugwan (상투관), the small crown used to protect the topknot. The men tie their hair into topknot while the boys braided their hair, just like unmarried girls. Satgat (삿갓) was the conical shaped hat worn to protect the wearer from the sun, especially the commoners and the farmers. Tanggeon (탕건) was the small hat made from horse hair and worn by men indoor or under their gat. Yanggwan (양관) was a ceremonial crown worn by the officials during important events such as weddings and national ritual ceremonies. Unlike jegwan, it’s gold in colour. It was also known as geumgwan because of its colour. 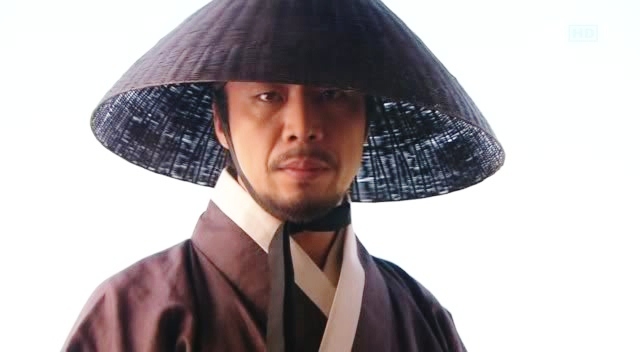 Yugeon (유건) was a hat that was worn by the scholar of Joseon Dynasty. Made from cloth, most of the time silk. The list is still not complete since there are several types of hats that I’ve seen in drama but I can’t figure out what their names are. If you happen to encounter those hats that aren’t featured in this post, do let me know! Let’s try to figure it out together, shall we? Hello! And thank you for this! I’m an artist working on a series of portraits, and this helps immensely. – Was eoyeo meori limited to married women? – For that matter, was the style worn outside of weddings? – What rank was required for the elaborate ornaments, like daesu, tteoguji, or keun meori to be worn? – Were those ornaments used only for ceremonies, or were they used as a status symbol? I’m wondering specifically about unmarried princesses… how much of this could they wear? and under what circumstances? General knowledge is good too! Thank you again. This made my research so much clearer! 1. Yes, eoyeo meori was limited to married women and it’s reserved for the upper class women, namely yangban and the royal family. Yangban women could only wear this style for ceremonies and the exception was made for the highest ranking court ladies since they would be sporting eoyeo meori during official ceremonies in the palace. 2. If you mean wedding ceremonies, then yes but only for royal women. 3. Daesu = crown princesses and queens consort; tteoguji = all royal consorts, royal concubines, and high ranking court ladies (sanggung); keun meori = same with tteoguji. 4. Those ornaments in #3 were reserved for ceremonies. 5. As for the unmarried princesses, they couldn’t wear any of the ornaments and hairstyles stated above since those were only for the married women. It was not clear whether they would participate in national ceremonies or not but for the married princesses, they would wear hwagwan together with their dangui or wonsam. Hope my answers are helpful. Sorry for the late reply ^^; Good luck for your projects~! You’re welcome! I’m happy to know that this post can be of help to you 😉 Good luck for your presentation! Just loved, loved, loved this article! Entered hoping to find a tutorial for these hairstyles but I was impressed to find out they were wigs since back then, so I guess I just have to keep wearing my boring straight hair. WOW! Those hats and hairdos look sooooo uncomfortable Even when I wear my hair in an updo, it feels so great to let my hair down. Imagine wearing those day in and day out! Thank you so much for your explanations. I’d love to know more about this hat (was it historic, or something invented for the drama)? 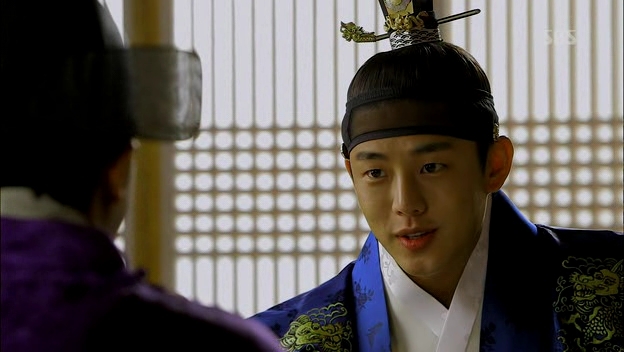 Oh hi~ you have a nice article going here~ just one question – in dramas based in Early Joseon I’ve seen (Queen Insu, later part of Tears of the Dragon, King and Queen) a particular headgear was used in place of the daesu, similar to a Ming Dynasty Chinese crown.. do you know what that one’s called, by any chance? Hello ! I love historical dramas and I’m starting to really get an interest in hats and hair styles since they’re so diverse and say so much ! 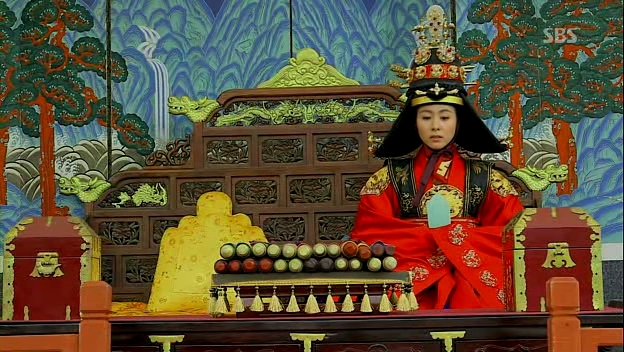 I am watching The Merchant Gaekju 2015 and sometimes characters have what looks to me to be a paerangi with two white ball like packets on top… ( http://bntnews.hankyung.com/bntdata/images/photo/201601/c85c10e8d8cf921e0ad2ad2beb000589.jpg ) Would you happen to know what kind of hat it is, and why there’s two little white thingy on top? I’ve been looking for informations but to no avail TT Thanks in advance ! Hello again! I am dropping by again with another question. I am watching Mr Sunshine and wonder what is the reason behind Dongmae’s scene of cutting Aeshin’s hair. 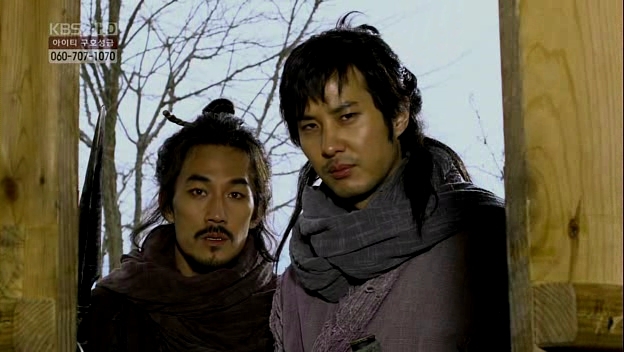 Does it have any implication for a Joseon noble woman to cut her hair at that time? Again, thanks in advance! 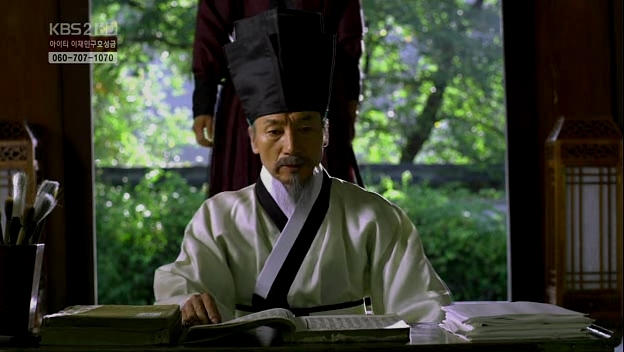 Sorry for missing out your question years ago..
1 – For the merchant hat, there’s an interesting story behind it: it was said that when the first king of Joseon, Taejo, got hurt by an arrow during a fight against Jurchen, and a merchant named Baek Dal-won saved him by using some cotton on his wound. Hence, Taejo gave the permission for traveling merchants to put cotton balls on their hat paeraengi as a symbol of their status. Another story states that the origin came from merchants storing their food in shape of ball, which was the rice ball or jumeok bap. 2 – For Ae-shin’s hair question…hair, in Confucian teaching, is regarded as a gift from the parents to their children, hence one should take good care of it. Just like how injuring one’s body is regarded as unfilial act, cutting hair is frowned upon. In older Joseon, it would symbolize cutting off ties with one’s parents, but in Ae-shin’s case, Dong-mae probably wants her to break free of the ties weighing her down..which is her status as a noble woman. Hello! 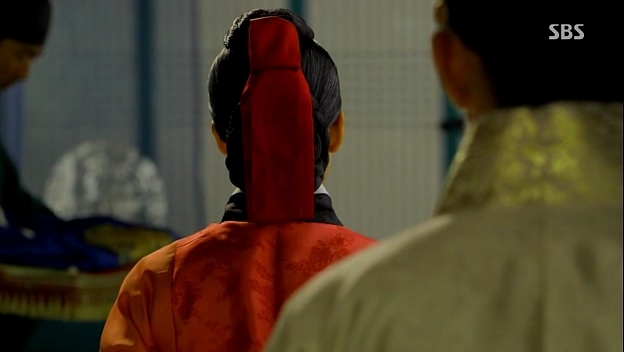 🙂 I have noticed that in some dramas (for example, Mirror of the Witch) which take place in Joseon Dynasty and earlier time periods, some unmarried men will be wearing the top knot that I thought was reserved traditionally for married men. Is there a reason for this? 🙂 I’ve noticed it quite frequently, but most english-sources online claim the top know was for married men only. The reason was the capping, or coming-of-age ceremony. Men would have their hair tied into a topknot and given a long coat+hat during this ceremony to symbolize their transition from childhood to adulthood, and the ceremony would be held when they were around 15~20 years old. However, in some cases like members of the royal family, marriage often came before the capping ceremony, hence the wedding ceremony more or less replaced or held concurrently with the capping ceremony. Thank you so much for compiling this! It’s been extremely useful as a reference.